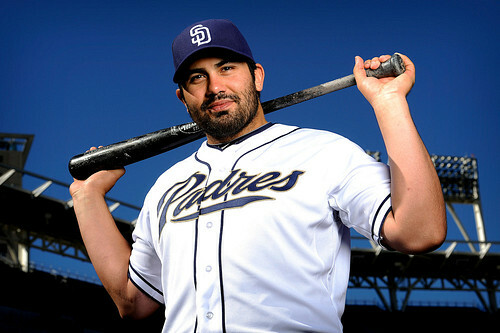 In acquiring outfielder Carlos Quentin this offseason, GM Josh Byrnes made a big step towards addressing the Padres need for a legitimate power threat in 2012. Originally signed by the Diamondbacks in the first round (29th overall) of the 2003 First-Year Player Draft, Quentin has displayed consistent pop at the plate over his 616 Major League games. Since joining the White Sox for the 2008 campaign, the slugging outfielder has hit 20 home runs in each of his last four seasons, averaging 26.75/year. During his career, Quentin has averaged a home run every 17.36 at-bats, ranking 17th among all active players with at least 2,000 plate appearances. He has averaged an RBI every 5.48 at-bats, ranking 18th among active players. While spending the majority of his career in the outfield, Quentin has also seen time as a DH (45 starts). Over his six-year career, he has made 526 starts in the outfield, with his team going 282-224 (.536) in those games. Quentin joins the Padres following three years of consistent improvement in batting average (.236>.243>.254), slugging percentage (.456>.479>.499) and OPS (.779>.821>.838). In 2011 he was rewarded for his performance by being named to his second All-Star team (also 2008). The right-hander boasts a .346 career on-base percentage that is helped by his incredible knack for getting hit by pitches. Entering the 2012 season, he has been hit by 211 pitches over 1,009 games in an eight-year professional career (counts minor league games). He ranks tied for 13th among active Major Leaguers with 97 HBP’s, despite having over 900 fewer at bats than anyone else in the top 20. A local boy, Quentin graduated from University of San Diego High School, where he set school records in home runs and RBI. In addition, he was named the league Defensive Player of the Year in football and was a member of the state champion basketball team. Quentin then attended Stanford University, where he played in three consecutive College World Series from 2001-03 and was a finalist for the 2003 Golden Spikes Award.